Urgent and Not Important Tasks. Don’t waste your time on them. Not important and urgent tasks should never be done. Resisting the temptation to check off another item on your To Do list can be difficult. It’s satisfying to complete tasks, but ultimately short-sighted to finish something that’s urgent, but not important. Your time is a precious resource and using it wisely is good resource management. Whether you’re an entrepreneur, working your way up the corporate ladder or just starting your career, managing your time well is key to your success. Executed efficiently, an organized day produces better work results. For content writers, staying focused calm allows for better clarity and creativity. Marketers responsible for building brand and customer loyalty have multiple projects to manage, which means task prioritization is essential. An example of a task that is Not Urgent but is Important is business blogging. Social media has earned its place in the business world, but many executives don’t make the time to build and grow their blogs. Blogging has evolved into one of the most effective means for generating leads. It’s become an important business task, but it’s not urgent, so many business managers continue to put it on the back burner. 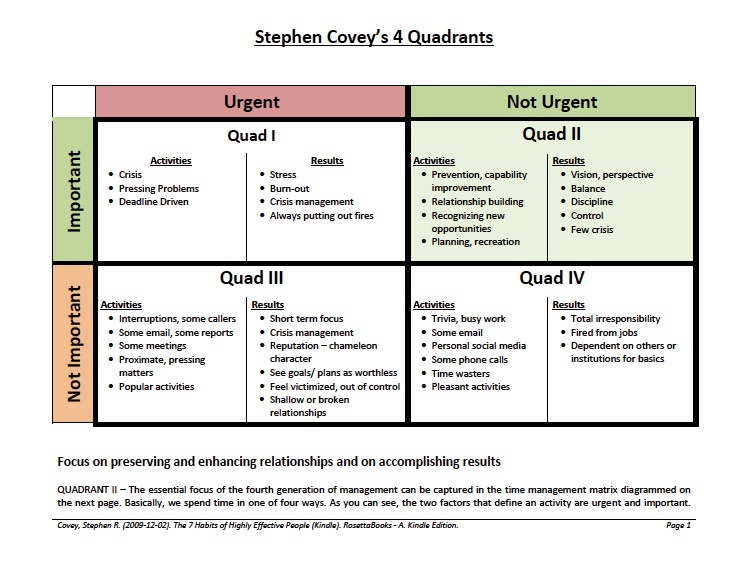 With prioritization, focus and discipline, you can make time for the tasks that matter most. Protect your time and prioritize your tasks and you’ll enjoy higher productivity and peace of mind.